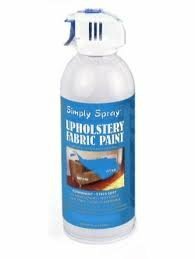 Simply Spray Upholstery Fabric Paint is a non-toxic, non-flammable aerosol paint for use on all absorbent materials. Once applied, the paint absorbs in and does not change the feel or stiffen fabrics. It is permanent, fast drying and will not rub off once dry (suggested 72 hours). For best results, ensure absorbency of materials by testing a small area with water first and make sure material is dry, free of oils and loose dirt before painting. Upholstery Fabric Paint will rejuvenate, restore or change the color of fabric and is recommended to change light colors deeper shade or darker colors. It can be used on sofas, chairs, pillows, carpets, curtains, lampshades, linens as well as car, boat and RV interior. If you have any questions about this product by Simply Spray, contact us by completing and submitting the form below. If you are looking for a specif part number, please include it with your message.